There's something very special about the power of sisterhood. As much as we might love a good romance, it's those wonderful relationships with female friends that really get us through the day. And those relationships most certainly deserve to be celebrated in fiction. I spent most of December reading sisterhood novels. Last year I sort of stumbled into writing my own sisterhood book: the story of three young women from vary backgrounds who search together for meaning and truth. And although the book is complete, I wanted to go back and spend time studying the genre. See how the experts do it in hopes of improving my own book. Here’s what I discovered. Sisterhood books are not about the classic “hero’s journey.” They are not about a protagonist going out into the world and overcoming an escalating set of obstacles to reach a specific goal. Sisterhood books are about relationships, pure and simple. They are a microcosm of society. Characters come together and react against one another. They learn and grow and change through the group dynamics. 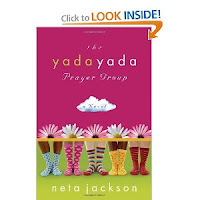 Usually, the book explores a theme as each of the “sisters” faces related challenges and struggles. More importantly, there is not one clearly defined “protagonist.” There are multiple protagonists. The groups itself becomes a character, a protagonist in the book. Both the group and each of the main characters have a full story arc. I'll stop now before I completely bore our reader friends with writer talk. But I think you get the point. There is something different and special about these books. They are not fast-paced, seat-of-your-pants type books. They may toss in some romance, but the true purpose of these books is to celebrate our female friends. Whether the friends share an apartment, a vacation, a prayer group, or a pair of traveling pants, the synergy between them is the true story. So let me tell you about some of the gems I uncovered. 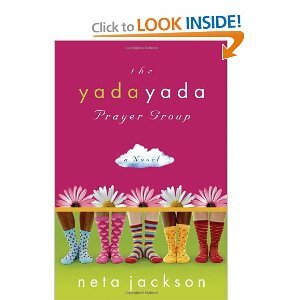 The Yada Yada Sisterhood with its delightful cover no doubt gets much credit for bringing the sisterhood motiff to the Christian world. While I did not personally connect with this book, it had many great moments and spiritual lessons. I think women over 50 would really enjoy it. 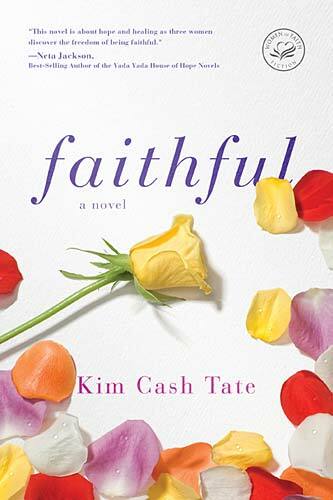 My favorite of the bunch was Faithful, a new novel by Kim Cash Tate. I related to all of the characters and their conflicts, and the theme truly spoke to where I am in my life right now. Similar to the Yada Yada's and the women in my own book, her characters came from a variety of ethnic backgrounds, which always makes for a fun read. I would give The Potluck Club special recognition for being the funniest and having the zaniest characters. And I give Robin Jones Gunn extra points for writing her Sisterchicks series that provided her a travel budget to some of the coolest locations in the world. Smart lady :) The books that best related to my own were those of the Bloomberg series by Melody Carlson with its twenty something characters. These books are great for the younger set. So that’s my quick assessment of Christian sisterhood novels. And my conclusion about my own? Well, I’m still learning and growing as a writer, and I can’t promise that I’ve gotten everything precisely right yet, but I am more excited about the genre than ever. All I can do now is keep working and praying and hope for the best. This helped me understand the sub-genre better. I haven't read any of them but I've certainly heard of the titles. I really respect all the thought, prayer and research you are putting into the decision on where you will put your writing talents this year. Dina, I loved this post and your "writer talk"! I really like sisterhood novels. For me the author hits a home run when she can get me to love a character that is way against my type, and help me to understand what makes that character tick. Off topic- good stuff on your personal blog about inner-healing. Yes, Cheryl. This novel really originated with me wanting to introduce a Muslim character to the Christian audience. But, I really grew to love all three of my girls and their unique struggles. Each is wrestling against what they were raised to believe and searching for truth. If you like my writer talk and want more, I did a slightly different version of this on my personal blog with more analysis. Glad you enjoyed the inner healing posts. I actually used them on Inkwell during December, but I know a lot of people were busy with the holidays and probably missed them. Last one will be on my personal blog next week. I haven't read any of these either, so I'm going to have to check them out. They sound a bit different from my usual reads of late (ie historical!!) but I would love to lose myself in the humor of a book like The Potluck Club. Thanks for the recommendations, Dina, and I echo Deb: the work and prayer you're putting into honoring God through your writing is inspiring. Praying for you! Susanne, if you're looking for a purely fun read, the Sisterchicks are my top pick. Potluck Club is hysterical in places, but has some really sad moments too. I usually shy away from these type of stories, but maybe I shouldn't. I've read a couple of the Yada-Yada books and liked them. Of course, now that I think about it, most of the secular trilogies I like have three sisters or three BFFs tying them together, but they don't fit the genre here. Hmm. Thanks, Dina, for doing all this research! It helps me understand more about the category. I didn't want to put it right in the post, but I really struggled with the Yada Yada's because it only had a single protagonst, and quite frankly, I couldn't stand her. She was the classic middle aged white legalistic Christian woman...aka...the woman I hide from at the grocery store. I really wanted more POVs. The other ladies were so vibrant and fun, and clearly the author didn't approve of the legalistic woman's attitudes, I just didn't personally want to spend that much time with her. But, this is an example of a great book that can really minister. The author hit right at the CBA target audience. I know my aunt read these books and loved them. And I don't think she reads much Christian fiction. My mom loved the Potluck series, which shocked me because she's miss faith woman and there's something tragic right in the first book. But obviously these novels strike a chord with that generation. By the way, Faithful, was just a darn good book. It didn't play up the sisterhood aspect. More of a triple protagonist women's fiction than an obvious sisterhood novel. I recommend it to anyone. Are you kidding me? Introverts of the world unite.